As you all know, because I’ve mentioned it thousands of times, I recently moved to a new apartment… well, it’s more like a condo/town house. I’ve been wanting to do a house or room tour post since I found out we were moving, but since the entire place isn’t done yet, I’ll settle for just doing a tour of my room for now. Below (and in the picture above) you can see my brand-spanking new bed which is also my first ever queen size bed. I’ve never had anything larger than a twin size, by choice, since the twin size took up less room in all of my previous rooms. But, I am older now and a queen size bed seems more fitting for a twenty-something to have. The comforter set is one of the first things I fell in love with. It was on clearance at Kmart and was nothing like I imagined I’d end up with, but it works. And did I mention I love it? The trunk at the foot of my bed was something I got many, many years ago when I first got into the Harry Potter series… I loved the idea of a trunk and it works to store things that just don’t have a home within the walls of my room. Using one of my photography lights as a main light was probably the best idea I’ve had for my room, other than the comforter set. It just gives my room that artistic feel and it’s really been helping for my creativity. The light is set up to the one outlet that works with the light switch near my door, so at night I can just flip the switch and on goes my light. My other two photography lights are stored in their carrying case, in my closet, for when I need them. Next we have my desk area. I’ve been doing well so far to keep my desk uncluttered, and I’m hoping to always keep it that way. I have a tendency to let a ton of notebooks and/or DVDs get piled up on the empty space to the left of my computer. I have to say I’m enjoying the little ridge that the previous tenants put on the wall to place small items like my Instax Mini 8 camera and the sign above my bookcase. I had to give a close up of my bookcase, even though you can see part of it in the desk shot. It’s only three selves, but I don’t need more than that at the moment because apparently I’ve donated a ton of books over the past few years (but I’m quite sure my best friend still has a few that she borrowed over the past three years). On top of the book case I have the boom box I borrowed from my mom when I was setting up my room, but she told me to keep it in here for now. And of course we can’t forget that amazing “Go away, I’m reading” sign on top! I wasn’t originally going to show my closet, but I can’t ignore those awesome shelves and cubby spaces the last tenants built in there. 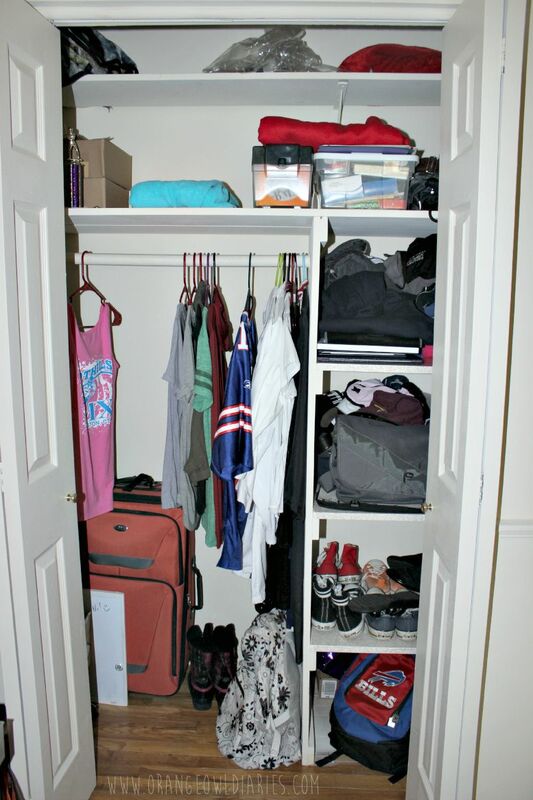 It works out great for me because of all my hooded sweatshirts, sweatpants, hats and shoes (which take up the top three cubby shelves). And on top are just a few miscellaneous things like extra desk items, backpacks and blankets. Lastly, we have my dresser. I’m kind of a space case and didn’t get a picture of the whole thing, but then again, everyone knows what a dresser looks like. This one is pretty simple. So on top we have two graduation stuffed animals I got back in May, my yearbook from senior year of high school, and two boxes I use for jewelry. The large box is used for the majority of my jewelry while the little graduation hat holds the time-turner necklace I got from a friend. On the “shelf” on the wall is a picture of my best friend and I back in 2009 and I have to say, the picture really describes our friendship (ha!). Next to that is my perfume, Sweet Honesty, which I’ve been wearing since the second grade. There we have it… that’s my room! I can honestly say that this is my favorite room that I’ve ever had the pleasure of living in. 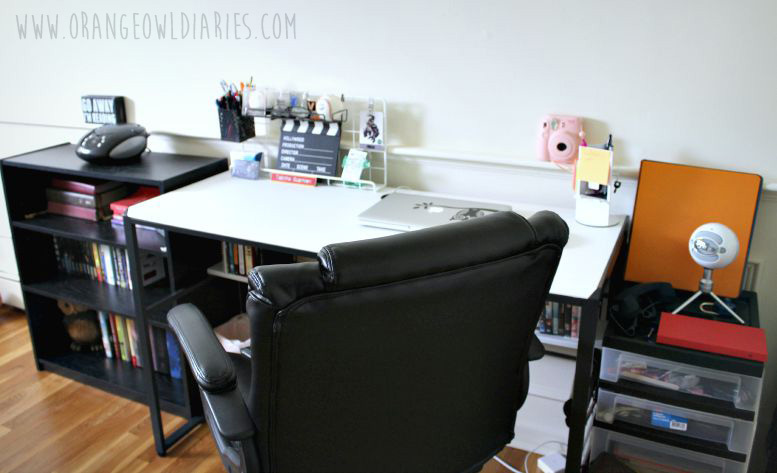 The amount of space is perfect as are all the items I have (my bed, desk, bookcase, etc.). I don’t know if you noticed, but I do not have any pictures up on the wall just yet, but I have a wish list on Etsy of different prints I really like and want to get in the upcoming weeks. I will also be hanging up my Bachelor’s degree above my desk once I get a graduation photo to put in the frame I got from Michael’s. 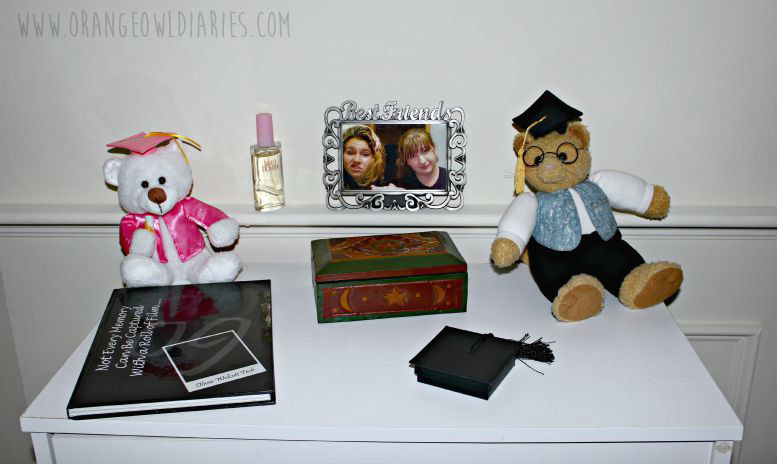 That aside, I hope y’all enjoyed my room tour post – I really enjoyed writing up this post! Bonus points for readers who can tell me how many owls you saw in my room! Oh man, I absolutely LOVE the comforter, and the photography light idea for a light at night. What I love the most about it was that was not really what I expected to end up getting! Ha.